Ice buckets are great tools to have on hand for small and large gatherings alike, and a glass ice bucket is one of the most elegant options. 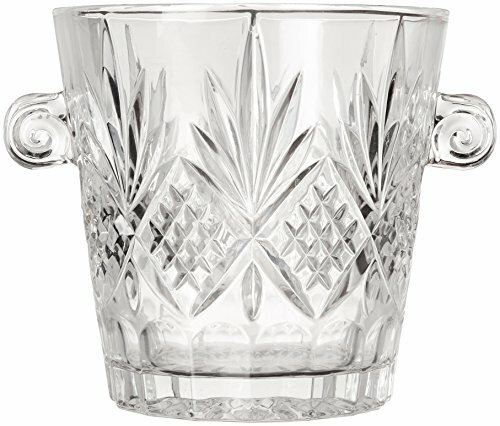 This article presents the best crystal and glass ice buckets you can purchase online, sorted by their average customer rating in ascending order. We also analyzed materials, design, capacity, and size of the products that made our list. This paneled ice bucket can hold up to 30 ounces, weighs 1.9 pounds, and measures 6 x 5.2 x 5.2 inches. It comes with a pair of metallic thongs and a stylish, smooth handle with a sleek design and elegant finish. 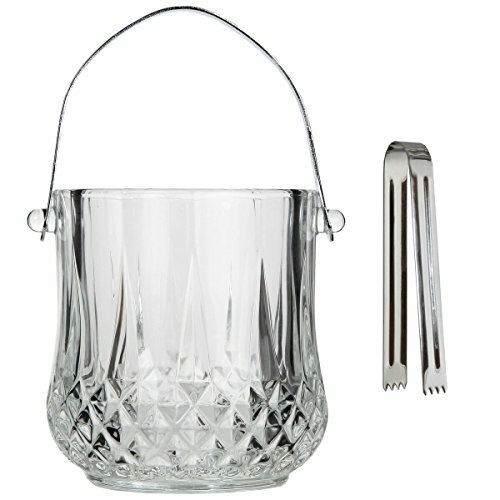 Some customers mention the handle is a bit shorter than what’s shown in the product image and seems a bit flimsier; however, they note this glass ice bucket will accommodate parties of up to 20 guests with no issues. This vintage ice bucket has a capacity of about 32 ounces, weighs 1.9 pounds, and measures 5 x 4.9 x 5.5 inches. It is made entirely from glass and features stylish double handles; it also comes with a set of metallic tongs. 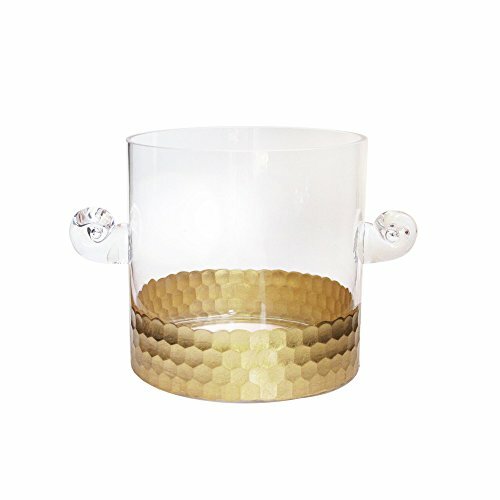 The base of this glass ice bucket features an elegant cutting pattern that improves the overall aspect and increases the stability of this bucket. This ice bucket measures 7.7 x 6.2 x 6.7 inches, weighs 3.2 pounds, and is made from high-quality crystal. It features a thick bottom which increases its stability and sleek vertical lines that add to its elegance by dispersing the light just right to show the material’s clarity. Its This ice bucket will fit most dinner and party settings, both modern and traditional. It's made of durable acrylic with cut-out handles allowing for easy mobility. This glass ice bucket was designed in Italy and is made from lead-free materials. It features a timeless versatile design with sleek curved lines and spiral handles with a traditional feel. It weighs 2.6 pounds, measures 7.9 x 7 x 10 inches, and is made from thick, yet luminous glass. Although it’s not the largest ice bucket on this list, it’s definitely one of the most elegant and is one of our favorites. Note: Since you’re here, you might also be interested in our article on the best stainless steel ice buckets! This ice bucket features a classical carved design with spiral handles and is made from non-lead Dublin crystal. The carved pattern features cross-hatch lines that will boost the elegance of your bar. This bucket measures 6.5 x 6.5 x 8 inches and weighs 5 pounds – not the largest in our top, but definitely one of the classics that will last for years, maybe even decades thanks to the thick crystal. Most reviews mention this ice bucket looks as sophisticated in real life as it does in its product pictures and it does not disappoint. If you need a larger ice bucket for a special event but are looking for a retro design, you can also consider the Crosby Marquis Ice Bucket by Waterford. This pattern features a clean grid carved into thick, lustrous Crystalline. This bucket will hold up to 91 ounces of ice, measures 7.1 x 7.1 x 7.4 inches, and also comes with a set of metallic tongs. It’s another one of our favorites thanks to the design and the resilience, as most reviews mention the glass is much thicker than most other ice buckets available online. The Cristal D’Arques bucket features a sturdy stainless-steel handle that you can swing out of the way to fill the bucket, then easily carry the bucket with no risk of slipping. The first things you notice about this glass ice bucket are its clarity and sparkle due to its Diamax Glass and the diamond cut surrounding the base. Also, with measurements of 12 x 9.8 x 6 inches, the Cristal D’Arques Longchamp is one of the largest buckets in this top. 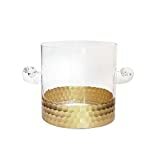 If you want a luxurious ice bucket that was designed and manufactured in France, this is the best one for you. 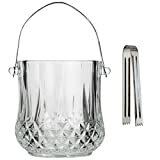 This ice bucket is made from Waterford crystal and features a timelessly elegant design. It doesn’t have any handles but comes with a set of beautifully designed metallic tongs. This crystal ice bucket measures 6.7 x 6.7 x 6.6 inches and can hold up to 74 ounces of ice. Unlike the other buckets on this list, the Brookside from Marquis by Waterford comes as clear and blue tinted so you can pick the one that fits your style best. 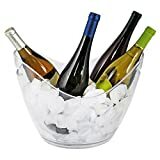 This is the best-rated glass ice bucket and, according to online reviews from verified customers, it looks impeccable and is long-lasting. This ice bucket features a very stable base and a minimalist design. It’s made from thin glass that also adds to the simple design, and so do the clear plastic tongs and handle. This glass ice bucket only weighs 1.5 pounds and measures 4.5 x 4.5 x 5 inches. It’s one of the smallest ice buckets on this list, but one of the best-rated, too. Most customers recommend this bucket for small gatherings like family dinners or romantic dinners considering its capacity, but this really depends on how much ice you usually go through. 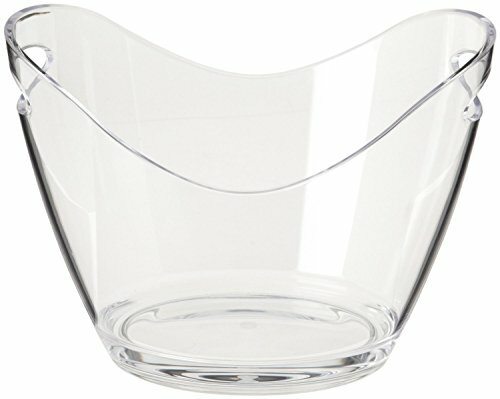 The best glass ice bucket according to ratings and reviews from verified customers comes from Marquis by Waterford thanks to the high-quality material & manufacturing techniques. However, the Circleware, Godinger, or Luigi Bormioli ice buckets are also reliable choices. What’s your favorite from this top?